Within the past couple of weeks, trade unionists have had a run of good news. Employment Tribunal fees have been ruled unlawful, as have imposed changes to the Civil Service redundancy scheme. Not only that, but with a minority government propped up by the DUP, the Conservatives aren’t in a strong position to simply change the law as they did with past legal defeats. But this doesn’t change the fact that unions are at the weakest they’ve been in perhaps a century. The Trade Union Act made the most stringent anti-strike legislation in Europe even tighter. Not on the back of a great wave of industrial unrest, but at a time when strikes were at their lowest since records began. In June, it emerged that union membership was at an equally low ebb. Membership fell by 275,000 to 6.2 million in 2016, just 23.5% of the workforce. The public sector remains better off than the private sector, with 52.7% membership density compared to 13.4% in the private sector, but in both cases the trend is definitely a downward one. As stark as this news seems in its own right, it only gets worse when you look deeper. Senior figures from the Trades Union Congress (TUC) have analysed the statistics in some depth, and in private there is growing concern that the trend may actually be terminal. There are a few areas where the demographics of union membership are an issue. You’re more likely to be in a union if you’re full time, in permanent employment, while of course more and more jobs are part time and temporary with the increasing casualisation of the economy. But the area that sets alarm bells ringing – not just in the present, but for the future – is age. Workers are more likely to be in a union the older that they are. This means that while 30.3% of workers over 50 are unionised, just 8.3% of those aged 18-24 are. In all age groups, the representation amongst union members is disproportionate to the workforce at large. But while 35 to 49 year olds and those aged 50 plus are over represented among union members, 25 to 34 year olds and 18 to 24 year olds are under represented. The latter group massively so. This is not a new and sudden development. Membership density amongst younger workers is part of a wider, generational decline. The most telling breakdown in the TUC’s analysis is a table which divides workers up based on the decade in which they were born and within that group looks at how many born in a given decade were in unions at various ages. There is missing data. We don’t know how many of those born in the 1950s were members before they reached the 40-44 age group, and workers born in the 1980s obviously have yet to reach that age group. However, the ongoing decline is immediately apparent. This is being reflected in the demographics of trade union activists. Reps are becoming more reflective of the fact that the workforce is increasingly female, though men remain over-represented. However, at the same time reps are becoming older and whiter. Over half of senior reps are over 50 and just one percent are under the age of thirty. In other words, there is no next generation of union activists. Workers who haven’t joined a union by the time that they are 24 are unlikely to join a union for any significant length of time in their working life. This means that a crunch is coming, when the bottom falls out of not only the membership of trade unions but also the activist base they rely on in order to recruit and organise new members. There is no single reason for the membership crisis that trade unions are facing. However, there are certainly a number of factors that need to be taken into account. The first that many within the movement will point to is the fact that we have been under sustained attack for several decades. Though several previous governments tried to do so, Labour as well as Tory, it was Thatcher who managed to break the back of the union movement. Her triumph was marked by the imposition of the Trade Union and Labour Relations (Consolidation) Act 1992, which set in motion a steep decline in the number of working days lost to industrial action. In the past seven years, the Tories have been hammering the nails into the coffin. 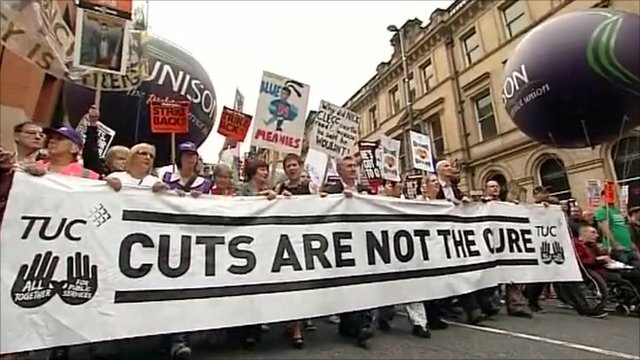 When attacks on public sector pensions provoked a lot of sabre rattling, and not too much else, that was the signal that they could also go for pay and jobs and even attack trade union rights themselves within the last great TUC stronghold. The Trade Union Act was the victory flag in that fight, the ongoing job cuts and selling off public services to the private sector everywhere from health to the courts being the spoils of war. But as tempting as it is to pin our problems on the bad guys, the unions also need to look at their own shortcomings. While the workforce is getting younger and more diverse, it is doing so in areas of the economy where unions fear to tread. It’s safer in the public sector. Easier. There’s too much hard work in an increasingly casual and precarious private sector, where workplaces can be as transient as the workers they employ. And there’s too little financial return – at least as far as the unions (functioning primarily as businesses trading on members’ subs) are concerned. Unions employ staff who work Monday to Friday, 9 to 5. (Though many lay reps who deal with full timers would say I’m being over-generous in crediting a lot of them with that much work.) This was fine when most workers were in a similar boat, but they’re not any more. Of course temporary, weekend, night shift workers are “impossible” to organise if it requires far more unsocial hours than you signed on for – and the wage bill that goes with that. The TUC are caught in a paradox, agents of their own decline through the very act of self-preservation. Taking on the role of mediator between the bosses and the workers saw them work to dampen down the very threat of workplace militancy which made them useful as mediators in the first place. Likewise, an unwillingness to organise where it isn’t cost effective to do so has seen them retreat into a cycle of declining membership and declining income. We shouldn’t discount the effect of the state’s attack on unions. But we cannot begin to turn things around without acknowledging the failures on the union side as well. Faced with all of the information set out above, we are left with two questions. The first is how we save the TUC and its constituent unions. This is the wrong question, and we ought to ignore that in favour of the second. How do we preserve and build up the strength of the organised workers’ movement? The reason we should ignore the first question is simple enough. If we focus on saving specific organisations, and organisational forms, we fall into the same trap that has ensnared the TUC. Instead, we need to look at what is effective in order to build up industrial strength in workplaces, build up the confidence of workers to act collectively in their own interests, build up our ability as a class to resist attacks on and win improvements to the conditions we live and work in. If doing that comes at the cost of a particular organisation’s continued existence, then it is likely that preserving that organisation would have harmed the movement, and we should not mourn its loss. This problem will not be answered in a blog post. But the first thing that we need is to take this issue seriously. To discuss it, openly, and come up with answers – as a movement.